If someone invented a practical 200-m.p.g. automobile and that automobile got a flat tire, nobody would claim that the car itself was a failure. The same applies to the Large Hadron Collider, the world's biggest particle accelerator, which went online in September, ran for 10 days and then had to shut down at least until next spring because of an overheated wire. The mammoth machine will send protons wheeling in opposite directions at nearly the speed of light, then smash them together at 6,000 times a second to try to answer such deep questions as why mass exists and whether the universe has extra dimensions. If it takes a few extra months to find out, so what? 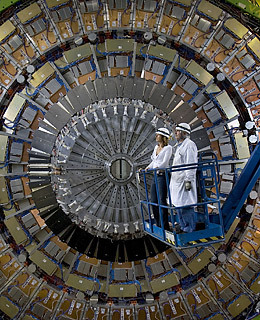 See pictures of the Large Hadron Collider.